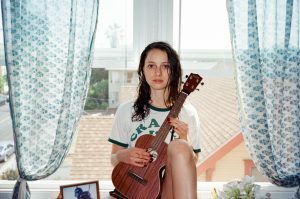 Folk/soul singer-songwriter Nora Rothman recently announced that her debut self-titled EP will be released on July 21st. She has already put out the spine-tingling track, “Note to My Ex Lover.” As the title suggests, it is a simple yet spine-tingling melody expressing the feelings one experiences while living in the negative space left by someone who is no longer there. Hailing from Hollywood nobility as the daughter of Tom Rothman (Chairman, Sony Pictures Entertainment) and Jessica Harper (Actress), it was inevitable that indie singer/songwriter Nora Rothman would find herself fully immersed in all things music and entertainment. At just three she laid down her first recording, at eleven she wrote her first song, and at sixteen she played her first professional show. Finding a relief in music while struggling with an anxiety disorder, Rothman immersed herself in songwriting and vocal studies as she channeled her contemporary rawness and pop sensibility into acoustic, 70s-esque arrangements. Now at 26, Rothman has more experience under her belt than most. After graduating from Brown University with honors in Creative Writing, she picked up a ukulele, and settled into her unique soulful folk sound while simultaneously appearing as an actress on stage and screen. As a professional vocalist, Rothman soloed at the KJazz Fall Benefit Concert, toured through Italy, played at the inaugural Life is Beautiful Festival in Vegas, and collaborated with visionary director Nathan Kim on their video “Strange // Humanshapes.” As an actress, Rothman has starred in Criminal Minds: Beyond Borders and acclaimed indie film, Hunky Dory. A singer-songwriter with a singular folk soul sound, Rothman finds a home somewhere in between the deep vocals of Sarah Vaughan, poetic lyrics of Joni Mitchell, and honest musicality of Frank Ocean. An avid feminist and political voice, Rothman moved to Boulder, CO working as a field organizer for the Hillary Clinton campaign and after a six month hiatus, returned to music to release her self-titled debut EP this summer. Recorded at The Fortress LA in downtown Los Angeles, the EP will feature three spine-tingling tracks that highlight Rothman’s dynamic vocal range and intimate songwriting. All songs on the EP were written and arranged by Nora Rothman and produced by Grammy-nominated Felix McTeigue (Radio Perfecto, Florida Georgia Line), Drew Guido (Ingrid Michelson, Sara Bareilles),and Nora Rothman. The EP was mixed by Drew Guido, mastered by Amar Lal, and engineered by Adam Lathrum and Brian Harris. I’m currently in LA, listening to Lady Lamb. My first time in the recording studio was at age 3, on my mom’s children’s album, delivering an impassioned performance of “Push the Elephant.” Growing up, I didn’t think a lot about becoming an artist. I’ve just always been making things. Now, the word artist has become an umbrella term for me. That includes music, writing, acting, production, social entrepreneurship, sleeping in, etc. I have read that because of your parent’s entertainment background, that it was a no brainer that you would go into this field too. Would you agree with that statement? Do you think that influenced you at all? I think to a certain extent it’s hard to avoid what’s in your blood. But my parents have both had extremely diverse professional lives. That scope of experience is what I aspire to more than anything else. Let’s talk about your soon-to-be-released debut self-titled EP. What was it like putting this collection together? Where did the inspiration for these songs come from? Did anything surprise you about this process at all? It started with the ukulele. I picked it up, was terrible at it, and the songs just gushed out. I love creative constraints in that way. Knowing nothing about the instrument, the music had to come from feeling. Trial and error. Which aligned pretty precisely with the inspiration for the songs. I was living alone for the first time, navigating a revolving door of—shall we say, educational—relationships. I was surprised that after spending so much time writing about other people, the lessons I ultimately learned were about myself. How did your already released single, “Note To My Ex Lover” come together? I was messing around (read: making mistakes) on the ukulele and found that chord progression. The chilling cheeriness of it inspired the lyrics to the song. Alex Da Silva threw in a killer bass line, Jessica Apperson wrote those harmonies, and boom. The diddy was done. Do you have plans to play out live much this summer? What has been your favorite show so far? What do you think are the main ingredients to having a perfect performance? I had an awesome show at El Cid a little bit ago, which was a blast because of the amazing players that joined me and the crowd that came out to support. That’s all you need for a perfect show. My next show on the books is the EP Release Show at Hotel Café on Wed, July 19th, at 8pm. I learned everything I know about singing from Sarah Vaughan, Nancy Wilson, John Coltrane, and Oscar Peterson. Songwriting, it was Joni Mitchell and John Mayer. Also, in terms of all-around artistry, just: Beyoncé. I would truly die to work with Justin Vernon, Blake Mills, Robin Hannibal, Brittany Howard, Nick Murphy. Anything, as long as they feel something. Do it. Don’t wait. Don’t be precious. Write, play, collaborate, perform as much as possible. Teach yourself everything you need to know to be able to make whatever you want on your own. And listen to lots of jazz.